You are here: Home / Squirrels / What Is the Best Squirrel Bait? To choose the best squirrel bait, you need to think like a squirrel. Just as sometimes we want pickles and sometimes we would rather have ice cream, squirrels bite on different baits depending on their circumstances. The stereotype of the squirrel is a picture of a rodent feeding on acorns and nuts. The squirrel eats acorns and nuts while they are still growing on the tree, when they fall from the tree, and from caches of stored acorns and nuts when they are not otherwise available. But the real answer to the question of what squirrels eat is not that they eat the seeds of trees, but rather that they will eat just about anything. In the wild, squirrels feed on the tender shoots of trees and shrubs in the spring. They dine on leaves and fruit in the summer. They prefer acorns and nuts in the fall, and they will rummage through their buried treasures all winter. But squirrels will also eat insects, eggs, small birds, small lizards, garden vegetables, flower bulbs, and even cold fried chicken and leftover mashed potatoes. Every 13 to 17 years when cicadas swarm in the United States, they will gorge on this seemingly inexhaustible food supply. When pregnant squirrels need calcium to help their unborn babies grow healthy bones, they will gnaw on the bones of deer and rabbits slain by other animals. And as anyone who has gotten too close and personal with a squirrel can tell you, squirrels have sharp teeth and can bite humans. The key to understanding what appeals to a squirrel’s appetites usually is not to look at proteins, fats, or carbs, but to consider water content. Mother squirrels nursing their babies have little opportunity to leave the nest to find fluids. Male squirrels locked in an attic or in their burrows may not brave predators to try to find water. “Juicy” fresh fruit and greens may be a much more attractive option for squirrels than dry nuts and seeds or sticky peanut butter, depending on the time of year and the location. But if you need to catch a starving squirrel, you can even bait your trap with pizza. Click the link to learn more about how to get rid of squirrels. An exception to the rule about the willingness of squirrels to eat just about anything may be found in the species of squirrels that hibernate through the winter. A hibernating squirrel depends on body fat for fuel during its long winter sleep. Saturated fat will “freeze.” Only unsaturated fat will stay in a liquid form that the squirrel’s body can use for food. The species of squirrels that sleep through the winter will fatten up on plants that contain a fatty acid called linoleic acid. There is abundant linoleic acid in pine nuts, grape seeds, flax seeds, chia seeds, sunflower seeds, wheat germ, rice bran, walnuts, macadamia nuts, and pistachios, and there are lesser amounts of linoleic acid in chicken, beef, and lard. Any of these foods will appeal to squirrels looking to put on weight for their winter sleep. Even in warmer climates where hibernation is not required, squirrels catch chill much more easily than larger land mammals. Their bodies have a large surface area that has to be kept warm with a small muscle mass and brown fat layer. The colder it is, the more squirrels will crave fat. Peanut butter, of course, is a great source of fat. Another fact about squirrels that helps in choosing the right bait is the realization that squirrels do not come into the world knowing how to crack nuts. They have to learn this behavior through trial and error until they find the best way to open each kind of nut with their teeth. Squirrels hold ends of a nut in their paws and stab the top of the nut with their upper teeth. They then drill a hole in the bottom of the nut with their incisors. Their sharp lower teeth rasp the hole to make it larger and larger until the shell drops to the ground but the kernel remains in the squirrel’s paws. Squirrels choose foods that allow them to eat the most food possible in the shortest time possible. This way they can scurry back to their nests before predators find them, and they manage to gulp down the food before other members of their pack can beat them to it. In choosing a bait, it helps to provide foods that are easy for the squirrel to eat fast. The bait should be firm enough to be held between the paws but soft enough to devoured quickly. Peanut butter only appeals to squirrels when there is relatively little competition from the rest of the pack and when there is no scent of predators. Peanuts, on the other hand, are the perfect bait for squirrels. The fox squirrel (Sciuris nigris), eastern gray squirrel (Sciuris carolinensis), native European red squirrel (Sciuris vulgaris) of Europe all bury nuts at scattered locations for future consumption. The Douglass squirrels and native red squirrels of the Pacific coast of the United States, however, gather all their food supplies in a single, central location known as a midden. The squirrels that bury nuts in random locations tend to be communal. The squirrels that gather nuts in a single location tend to be very territorial, defending their stores (although one observational study of Douglass squirrels conducted in the USA found that 97% of squirrels steal from the middens of their neighbors and 25% of all nuts are stolen). These differences have major implications for choosing the right bait for trapping squirrels—and for whether a squirrel is likely to be a pest. When setting out bait for squirrels that scatter their food stores, multiple traps are better. When setting out bait for squirrels that maintain middens, a single well-supplied trap is better. When setting out bait for squirrels that scatter their food stores, a variety of baits is better. When setting out bait for squirrels that maintain middens, a single bait you use every time is better. When setting out bait for squirrels that scatter their food stores (and identify them by odor), smelly bait is better. When setting out bait for squirrels that maintain middens (and have to use their sense of smell to identify thieves and predators), scentless bait is better. If a squirrel has a well-stocked larder off in some tree, of course, chances are you will not be troubled by them in your house. But choosing the right kind of bait for the right kind of squirrel will make a huge difference in the success of your trapping efforts. Zoologists observing how squirrels make their choices of which acorns to eat first made a puzzling observation. 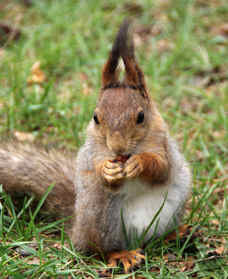 Squirrels tend to bury perfect acorns, but they gobble down weevil-infested acorns and nuts with gusto. It is true that insect-infested acorns and nuts are unlikely to sprout and grow into trees that can feed future generations of squirrels, but it turns out that the reason squirrels like “bad” nuts is not an altruistic orientation toward trees. Bug-infested acorns, nuts, and seeds don’t just provide squirrels with fat and carbohydrates. The insects inside the nuts and seeds and acorns provide a quick meal of high-protein. Squirrels naturally prefer the cookies and crackers and cereals we would throw out. Insects in food, for squirrels, is a major plus. Open-faced peanut butter sandwiches. It is important to present the sandwich European style, without the top slice of bread, so the squirrel can smell the peanut butter. Potato chips/crisps. Squirrels enjoy fatty foods. Fresh fruit, especially for a mother squirrel confined to an attic or basement. Fresh fruit provides water. Peanut butter by itself is more appealing to ground squirrels, that do not need to “feel” their food, than to tree squirrels, who judge their food by its crunch. Squirrels have an extremely acute sense of smell for a chemical compound called indole. This chemical is especially abundant in, oddly enough, orange blossoms and human feces. Orange blossoms will attract a squirrel into a trap, but any trace of human feces will warn it away. Alternatively, instead of trapping you could try repelling with a electronic squirrel repeller. And what about poisoned baits? Generally speaking, putting out poison for squirrels is more likely to kill other, desirable animals and leave the squirrels alive. It is rare to find fewer than 10 squirrels in a pack. Poison bait may make all 10 squirrels a little sick but may not kill any squirrels at all. On the other hand, pets and people can easily come in contact with the poison bait, sicken, and die. 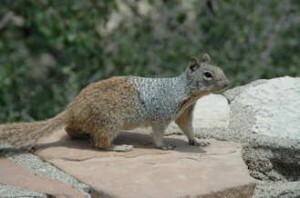 Ground squirrels are especially resistant to the most common poisons used in baits, and kill rates for other kinds of squirrels are almost never satisfactory. Now you know what baits to use, read this article on How to Bait a Squirrel Trap – Eight Simple Rules. 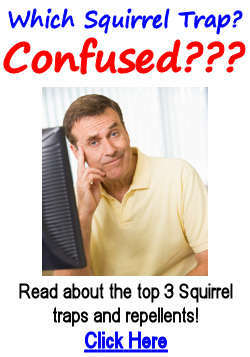 This article explains the numerous ways to catch a squirrel. From snare poles to one-way doors and body grips to Havahart cages. Great article. I have a humane trap which I used successfully for squirrels. But the lat one I caught died in the trap???. I baited with generic peanut butter. What do you think killed it. I want to avoid this in the future. I’m assuming you didn’t leave it trapped in the cage for days, so it died of starvation, then I guess it could be stress/ fear of being trapped? 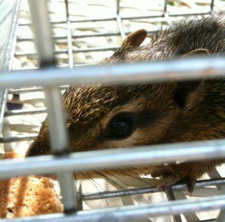 got a rodent or squirrel in between my kids bedroom walls, look in the attic and craw space with the cat no go. Can not find him but keep hearing him scratching, how can I get him. You could try teasing him out with his favorite food and setting a trap. I would also suggest encouraging him to leave by placing an ultrasonic unit in the space.